If you’ve followed a good number of other users, you’ve probably noticed that your main Twitter stream can quickly fill up with a lot of “noise”, sales pitches, or idle banter which makes it difficult to find the stuff you really want to see and/or respond to. Creating lists is a great way to filter out all that noise. For instance, you can create lists for Customers, Competitors, Industry Leaders, and Star Wars Addicts. Next, you simply add folks to the appropriate list. Then when you want to see what all your fellow Star Wars Junkies have been talking about and sharing on Twitter, you simply select the Star Wars list and everything else is filtered out. 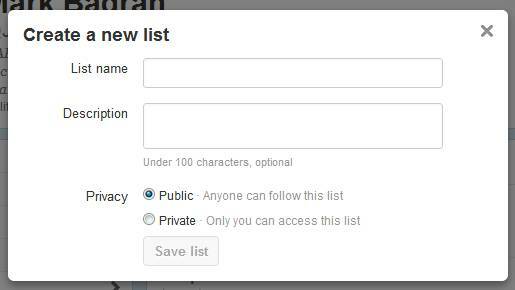 By the way, you can add Twitter users to a list whether you follow them or not. This can be a good way of keeping tabs on the Twitter activity of your competitors without following them and revealing your stealthy, James Bond 007 spying techniques. 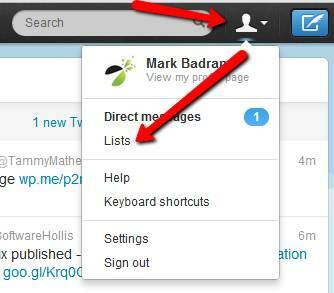 b) On the next screen (oddly enough, called “Lists”), click the Create List button. c) Give the list a name, an optional description, and determine whether this list is going to be private or public. If private, only you can see the list. If public, other Twitter users can see the list you’ve created and perhaps follow some of the folks there. A public list can be useful in conjunction with an event or to create a community that you want to share with others. As an example, Sage North America (@SageNAmerica) has created a public Sage Summit Twitter list here. One of the things we hear from Sage Partners is “I don’t have time to post things on Twitter.” But a tool like Buffer makes it easy to just incorporate social sharing into your regular activity online. Buffer allows you to add tweets to a queue and then automatically sends them out over your specified intervals (twice per day for example – once in the morning, another in the afternoon). Not only does the built-in buffering process keep you from posting 10 articles in 5 minutes which is enough to annoy anyone, it allows you to perhaps sit down on Monday morning, grab coffee, do some reading online, and share interesting articles or resources for the week. Queue them all up in one sitting and you’re done with it. By the way, there are other tools – like Timely.is for instance – that allow you to schedule tweets. Just do a Google search on “Twitter Scheduling”, try a couple of services, and use the one you like best. If you’re sharing an article online, the URL itself can take up most of the 140 characters that Twitter allows for. That’s why Twitter automatically shortens URL’s for you. But we also recommend that you consider using, instead, something like Bit.ly. Because not only does Bit.ly (and similar services like Ow.ly) shorten your URLs, it collects them in an account. That way, you can go back to Bit.ly, launch the reporting dashboard, see how many clicks have been collected on your shortened URLs, and determine what type of content resonates with your social network. In other words, it’s a way to quantify your social media effort. One of the biggest mistakes you can make is to constantly self-promote or try and sell something with every tweet. 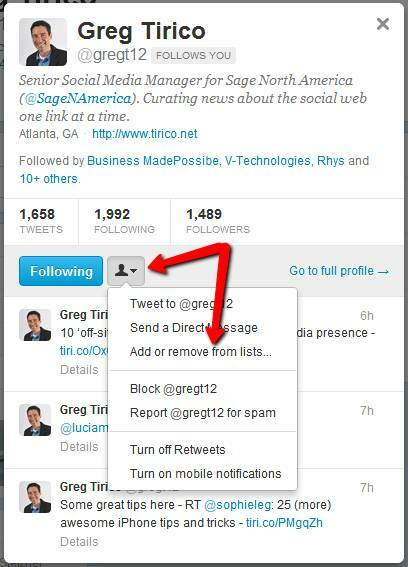 I’ve seen Sage Partner Twitter accounts where every message is a product pitch, link to a webcast, or promo. There’s no sharing involved, no useful articles or resources, and no engagement with other Twitter users … it’s just me me me 24 x 7. There’s no quicker way to disengage your Twitter followers and undermine any value that social media can have for your brand and business. Don’t misunderstand, it’s ok to sell and self-promote once in a while. But not all the time. Try earning some trust and likeability first (by sharing useful content and engaging other users). Then, you may find that your sales messages are better-received when sprinkled in among your other helpful tweets. There are plenty of Twitter accounts that are not run by real people. They’re automated Twitter “Bots” that follow thousands of accounts hoping you’ll automatically follow them back. Then they proceed to spew out spammy tweets, clog up your Twitter stream, don’t provide any value, and diminish your experience. So think before you follow or follow back. Here’s a quick scan you can do to determine whether a Twitter user is human. Moreover, determine whether or not they share tweets that are on target with your social media goals and provide value … or just clog up your stream with noise. Check the Follow Numbers – an account that is following significantly more Twitter users than are following them back is probably a spammer. It’s not uncommon to see an account that’s following thousands of users but only has a couple of hundred following them back. Scan Their Tweets – do a quick check of some of their recent tweets. This is probably the best way to determine whether a user is worth following or not. Are they all spammy, self-promotional, repetitive, or just lame and uninteresting? Then don’t waste your time. Check The Description and Profile Picture – if they haven’t bothered to upload a profile picture or include a quick description, they probably don’t use Twitter often, don’t have much to say, and aren’t worth following. And by all means if they’re still sporting the placeholder Egg profile picture, run for the hills. Here’s why (see Tip #1). Remember this … for any of the time spent on social media to be worthwhile and to put yourself in a position to potentially turn prospects into customers, you need to connect with the right people! P.s. If you want more useful marketing tips and tricks like this one, be sure to subscribe to our blog or follow Juice Marketing on Twitter. So what do YOU think? What strategies and tactics have you used to make the most of Twitter? Remember too that search engines are starting to use social media activity as signals to rank sites. I think most of what you do in social media should point back to a web site owned by you where there are ways that a visitor can get in touch with you. Look over Marks tips in this post – because there are tools that greatly automate this so you can spend 15 minutes in the morning and have an active social media presence all day (Bufferapp). John – totally agree. Great point. I’d also add that if businesses wait until Twitter goes “mainstream” and there’s loads of “hard evidence”, it will already have become a very noisy communication medium. And it will be far more difficult for YOUR voice to be heard. I think there’s plenty of evidence NOW that social media is driving traffic to websites and generating opportunity for many businesses. Kent – replace “twitter” with either “e-mail” or “website”, and this now should be obvious. Unless you are pushing a food cart, businesses that do not have e-mail and websites today are out of touch. I’ll bet the food cart guys even have websites and probably use twitter. Twitter will get there as far as mainstream business, and at some point it will be vital that businesses have that presence. All that I hear from social media gurus is hype and anecdotal evidence. Give me some hard data as to why I should use this medium, like how many construction company owners and CFOs use twitter regularly for news and information. Otherwise, the conclusion I must jump to based on my experience, is that twitter works for celebrities and social media types selling their twitter “expertise” but not for the average SMB vendor like Sage business partners. Kent – in a roundabout way, you’ve hit on an important caveat of effectively leveraging social media for business which is this … social media isn’t going to generate leads/revenue if your target market doesn’t use it. So if YOUR experience shows that construction company owners aren’t using Twitter, then it definitely is NOT time well-spent for you. But you definitely can’t make that assertion for ALL Sage business partners because they all serve different markets and there are some BPs leveraging social media effectively.